Epeirotes guard cavalry are more lightly armored than their Makedonian counterparts, but they make up for this with an agility born of horsemanship in the mountains and valleys of Epieros. The Epeirotai did not have the ‘tradition’ of Alexandros to call upon, but they did have the ingenuity and forethought of Pyrrhos. Epeirotes guard cavalry are more lightly armored than their Makedonian counterparts, but they make up for this with an agility born of horsemanship in the mountains and valleys of Epieros. 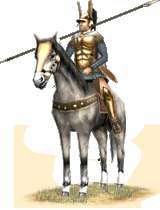 They are armed with the typical heavy cavalry equipment: a xyston, kopis, Boeotian helmet, and metal cuirass. However, they ride unarmored horses and are much faster than most heavy cavalry. Historically, Epeirotes cavalry dealt stinging blows to its enemies. Epeirotai smashed Illyrioi, Hellenes, Makedonians, and Romaioi with this decidedly Alexandrian guard cavalry. These men ought to be used in any situation that calls for speed, precision, and shock.